Fashion is important. Before someone tries to deny this in the comments, just take a second. If fashion wasn't important; would we really own more than one item of clothing? Would we really be churning up dyes so that we're not stuck with plain, raw fabric? No, we wouldn't. Whether you like it or not, we've all been suckered into valuing style and runways / collections are just one way of doing that. Oh hey! A fashion collection review just happens to be the purpose of this post. 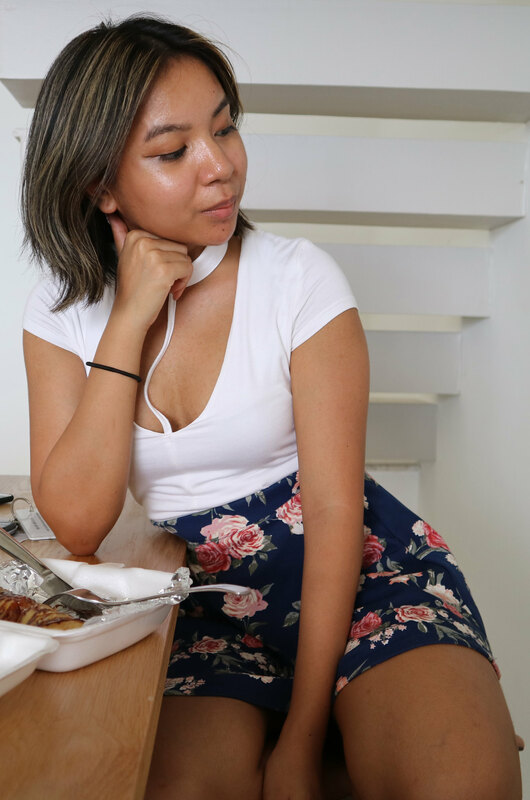 Edeline Lee describes their ideal consumer as a woman who "doesn’t care about [fashion] seasons". Her main goal was to create clothing that is "flattering, intelligent" while also encompassing fresh and clean colours. She has taken a lot of inspiration from Charles II's ruffles and neckpieces. 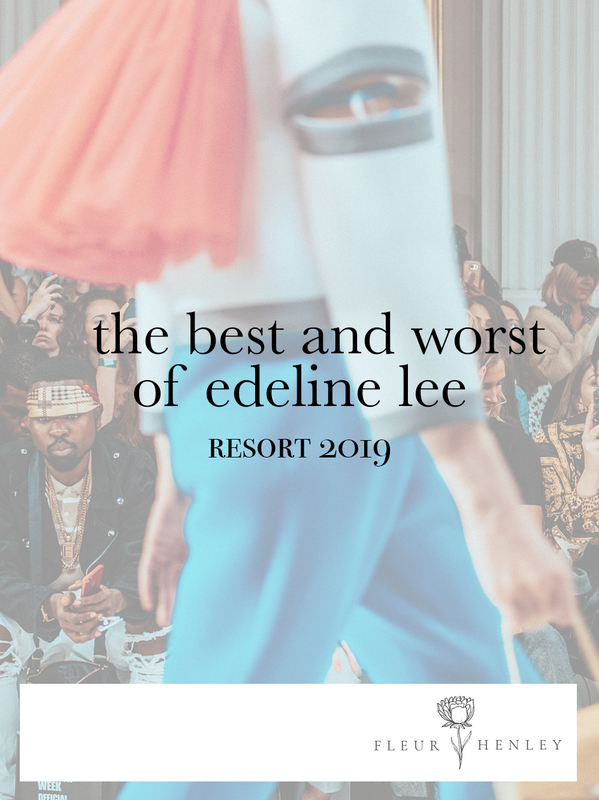 First things first – what is a resort collection? 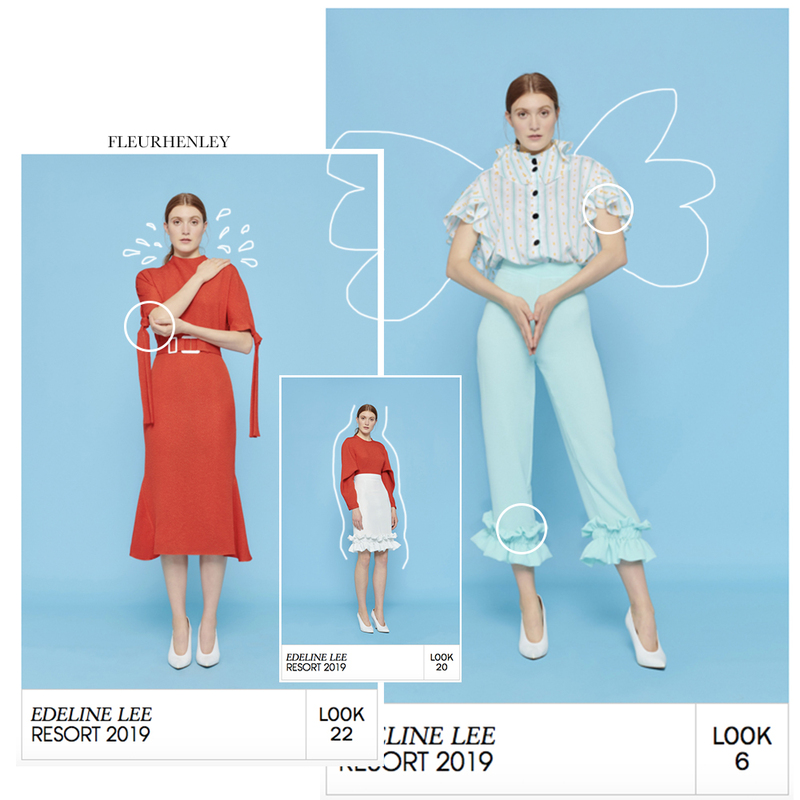 Seeing as how this post focuses around Edeline Lee's Resort collection, I think that's probably an important detail for us to know. According to Google, it's basically what designers call their holiday outfits. These are very similar in style to cruise or pre-spring collections. Yeah, I had to look that up. I'm by no means an expert at fashion and I realise that I'm not qualified to review this collection at all but I thought that I would give my insight regardless. Don't roast me too hard in the comments. Ooh, I love LOOK 6. The silhouette that LEE has created is incredibly interesting and I can definitely see the Charles II inspiration throughout the design. It's a two-piece outfit which can sometimes be hard to coordinate but I think that this has been done quite well. There are similar ruffles on both the top and bottom pieces, but it is under no circumstances too matchy - matchy. In fact, the flowy top and tighter pants go quite well together. The pattern used for the top isn't my favourite (I literally drag it a couple of paragraphs down) but the addition of buttons and the unique design definitely make up for that. The over the top collar is crazy; but in a good way. It's eye catching and, while it may make the shoulders look quite wide or hunched over, completes the outfit. The pants are a lovely clean colour that is completely in sync with what LEE was going for. LOOK 20 isn't a grand feat in design. To be perfectly honest, you could probably recreate this look with a trip down to any fast fashion store. The outfit isn't an amazingly brilliant combination of colours either; it's just red and white. However, I do love the classically simple aura that this outfit brings. It's basic without being boring. The details on the skirt are in a good place to be seen but not overtake the outfit, and the red sleeves only serve to compliment that. LOOK 3 reminds me of a burlap bag. Look at it. I feel like wrapping my lunch up and carrying it around in this dress. While LEE has definitely kept it consistent with her colour scheme, the overall design is lacking – to say the least. The collar by itself would have been intriguing, but when it's paired with the cinched in waist it definitely looks like someone's pulled on the flaps of fabric on the side and all of the material has been forcibly bunched together at the top. Search burlap sack or burlap bag on Google and you'll get what I mean. LEE describes the collection as 'polished' but LOOK 7 would beg to differ. While this is by no means a bad piece, it certainly doesn't live up to the favoured commentary. Instead, this is a sweet adolescent piece that has a tween girl vibe as opposed to something more matured. The design is certainly airy enough for a resort climate but, as a result, is quite unstructured in both design and vision. The simple pattern doesn't do the piece any favours either. Having lived in Asia my entire life, I can confidently say that the fabric mimics those commonly used by street vendors. The loose, boxy sleeves are also reminiscent of some of the popular styles among local sellers. I'm not saying that this is bad but when you can find similar pieces for a couple bucks on the street, it does take away from the originality. While the pulled in waist does add a little bit to the overall aesthetic of the piece, it can't do too much to negate the overall juvenile feel that this dress has going for it. I 100% realise that I didn't comment on look 22. Sorry!